The benefit of running the camera off the car cigarette lighter socket is that the power to the cigarette lighter socket is turned off when the car is turned off. This allows the camera to turn on and off with the car, preventing the camera staying on and draining the car battery when the car has been switched off. 1. Remember to unplug the camera from the cigarette lighter socket when you get out of the car. 2. Have your cigarette lighter socket rewired by a trained technician - expect to pay around £50 for this service at a main dealer. How will I know if my car provides permanent power? 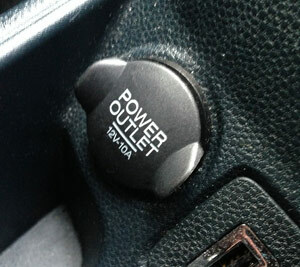 A simple test is to plug a car phone charger in and see if the phone is charged when you turn the car off. You may need to leave the car for an hour or so since some cars run on a timer where the power is turned off after a set period of time. As an alternative, you can hard-wire the camera straight to the car battery using a special hard-wiring kit. This provides permanent power to the camera but then cuts the power once the battery has reached a set level to prevent discharging. These are typically used when you want to take advantage of the parking protection mode some cameras provide.